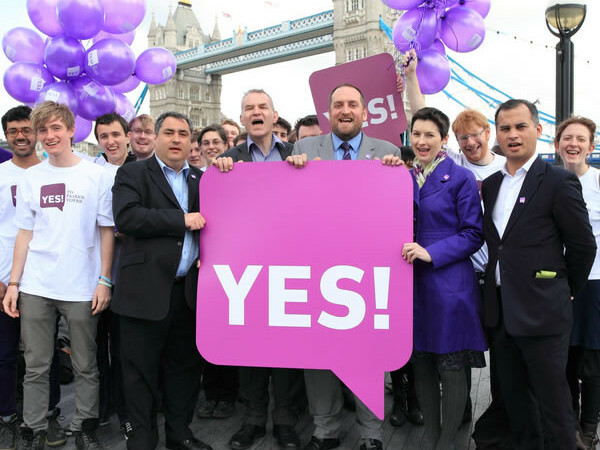 Green Party London Assembly member Darren Johnson is supporting a Yes vote on May 5th because it will mean people can start to vote for what they really believe in. I’m supporting a Yes vote on May 5th because it will mean people can start to vote for what they really believe in. For too many people, voting often ends up being a tactical choice. You have Conservative supporters tactically voting Lib Dem in some seats. You have Lib Dem supporters tactically voting Labour in others. And in many seats you have substantial numbers of Green supporters voting for someone other than the Green Party because they worry about their vote being wasted. This is the reality of First Past The Post: large numbers of people voting for their second or third choice because they feel their first choice would be a wasted vote. AV will help address this problem. It will allow people to express their genuine political preferences on the ballot paper – not just in their head. By being able to rank the candidates in your order of preference, it means that if your favourite candidate is not successful you could still have a say in who becomes your MP. Yes, AV raises the bar candidates have to jump to be elected. But it means a more honest form of voting where people can vote for who they really want. And it means a politics that reaches out more beyond rigid party boundaries. We in the Green Party are confident in our capacity to reach out. That is why we are in favour of this change, when extremist parties like the BNP are not. That is why the Green Party is urging a Yes vote on May 5th. While it is fair to say it is not the system we would have chosen ourselves, it is a major improvement on the current system. AV will help change politics. And the No campaigners are terrified of that change, coming out with the same sort of fanciful arguments, lies and scaremongering that opponents of democratic reform have done for centuries. When it was proposed that women be given the vote opponents argued that if women became involved in politics they would stop marrying, having children, and the human race would die out. It’s laughable now but it is not that different from some of the nonsense that the No campaign is currently peddling about AV. Boris Johnson has called AV utterly bonkers and predicted disaster if our MPs were elected in this way. Yet as Mayor of London, he himself as elected on a variant of AV which allows Londoners to cast a first and second preference for Mayor. Within the London Assembly, thankfully, the mood is different. Not only have Green and Lib Dem members come out clearly in favour of a Yes vote but a number of Labour members and Tory AM, Andrew Boff, have been joining forces to campaign for a Yes vote. I do urge electors to vote for hope over fear and take this small but significant step in improving our political system by voting Yes on May 5th. A few things jump out from this article. Firstly, it doesn’t surprise me that the Greens are in favour of AV. It’s the politics of self-interest. Secondly, if AV enables Green voters to vote with their conscience (i.e. put the Greens first) as well as have a say in electing their MP, surely this logic applies to voters of other fringe parties, e.g. the BNP? I can’t fathom why the BNP don’t support the change, but if reform gives Green voters more of a say then it’s dishonest to claim that it doesn’t do the same for BNP voters. Thirdly, the article suggests that AV will curtail, if not eliminate, tactical voting. This is nonsense. I would be shocked if voters did not consider how best to thwart their least favourite party when considering their second and third choices. AV may well be used as a sophisticated blocking mechanism. Lastly, I think comparisons, even if indirect, between a proposed switch to AV and giving women the vote should be avoided. There’s a wealth of difference between universal suffrage and a ‘miserable little compromise’, which would make our voting system more complex for no discernible benefit. One of those two is a democratic necessity. The other is trivial. I don’t think it’s necessary to state which is which. RT @leftfootfwd: AV is small but significant step in improving our political system http://bit.ly/enciwP > nice to see I made an appearance! That isn’t tactical voting. That’s expressing your legitimate opinion that you really do hate that party. Tactical voting is where you vote for a party you don’t really want because you think that they stand a higher chance of accruing more votes that your favourite party, thus trying to swing the balance against your least favourite party. Ranking parties you prefer above parties you dislike is not tactical. You might be right, Andy, in that spiteful voting is still voting with conviction. But I still regard it as tactical. For instance, if I live in a three-way marginal constituency I could vote UKIP first (for argument’s sake, of course!) and then Conservatives second and Lib Dem third, purely in an attempt to prevent Labour. In reality, I might despise the Conservatives and Lib Dems but would be well aware that my vote for UKIP would do no good. So, in effect, I would be supporting two parties I hate just to stop one I hate even more. Pretty spiteful stuff and not much better, if better at all, than the current system, where I can vote for one party to block another’s progress. Also, if anyone could respond to my second point I would be interested to get others’ views on that. Given that Huhne et al have been banging on about AV giving the BNP no more influence than under FPTP, I’m interested to see that the Green Party thinks that it will benefit from the reform (as a fellow minor party). How can any small party be in favour of AV? It raises the bar to being elected to 50% in every seat. Small parties are small because their opinions are considered either wacko or niche. There isn’t much point in being able to express your first preference for a party if it doesn’t help a candidate to be elected. The ONLY system that will help small parties is PR which because Britain is a semi-democracy at best is the reason it isn’t being offered. The only reason anyone would want AV is because they actually want PR, so it goes ahead that the reason we are here is that the yes crowd would rather we suffer a terrible system so people democracy suffers and the public get so annoyed that we then get a vote on PR? or is it that the Yes to AV crowd hope it’ll swing enough MPs to their side to force a PR ref in the future? Either way what appears to be the whole point of the vote is that we, the public, get a shoddy deal all for the vanity of the political classes, you just have to gauge the sentiment of the subjects to come to the conclusion this isn’t being done in the interests of the country but in the interests of politicians and supporters, which is frankly shocking and shameful. ‘Ed’s Talking Balls’, your secondpoint is exactly my point.